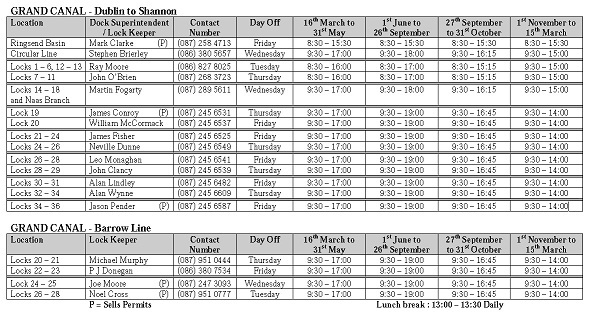 Masters, owners and users on the Grand Canal, the Barrow Navigation and the Royal Canal are advised that the daily seasonal working hours for Lock Keepers and Water Patrollers have recently been updated. 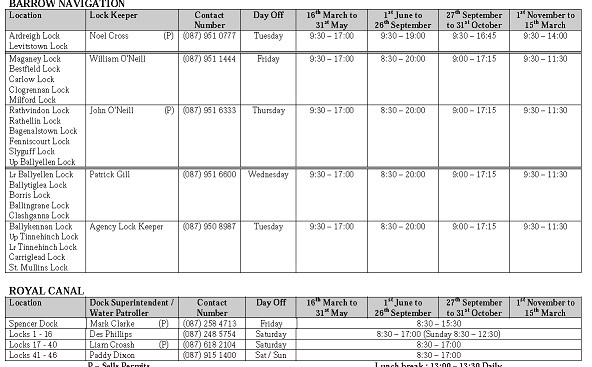 Specific details of the updated schedules are given on the attached 'Working Hours' table; including location, contact number & day off. Please refer to the relevant Navigation Guides for the locations of the locks. Waterways Ireland advises all Masters and users to contact Lock Keepers / Water Patrollers on the navigations prior to travel where possible. Waterways Ireland reminds Masters and users to leave all locks as they were found. It is normal to leave the lock empty with a tail rack up, the breast (upper) gates closed and all racks on the breast (upper) gate side of the lock down or closed.